OAKLAND — The brother-in-law of former Your Black Muslim Bakery leader Yusuf Bey IV, arrested Thursday after failing to appear as a witness at Bey IV’s murder trial, was released Friday after a brief court hearing. As Saleem Bey — legally known as Darren Wright — sat in the courtroom in a red jail jumpsuit, Alameda County Deputy District Attorney Melissa Krum told Alameda County Superior Court Judge Thomas Reardon the situation might’ve been a misunderstanding. Bey was subpoenaed to appear Wednesday but had read news accounts Tuesday reporting that testimony in the trial of Bey IV and Antoine Mackey — charged with the murders of Oakland Post Editor Chauncey Bailey, Odell Roberson and Michael Wills — were suspended until next week due to an alternate juror’s illness, Krum said. He assumed the delay meant he didn’t have to appear; she tried to call him to advise him otherwise, she said, but left a message on a line he doesn’t check often. Reardon ordered a bench warrant issued Wednesday after Bey didn’t appear, and Oakland Police arrested Bey late Thursday morning. Despite Krum’s explanation, Reardon gave Bey a stern warning Friday. Outside the courtroom, Krum said Bey also had missed a meeting with her Monday, and since has explained he mistook the date they’d agreed upon; that meeting, however, was not under subpoena and wasn’t the subject of Wednesday’s warrant. Saleem Bey has said he was the confidential source providing information to Bailey in 2007 about the bakery’s financial problems and Bey IV’s mismanagement. 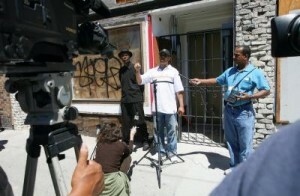 Prosecutors say Bey IV was incensed at Bailey’s past coverage of the bakery as well as this new investigation, and so ordered bakery handyman Devaughndre Broussard to kill Bailey with three shotgun blasts as he walked to work in downtown Oakland on the morning of Aug. 2, 2007. Broussard began testifying March 23, and his testimony is expected to resume Monday. Saleem Bey adopted the Bey name in the mid-90s after already having worked at Your Black Muslim Bakery for several years. He’s not a blood relative of Yusuf Bey, the patriarch who founded the company, but is married to one of Yusuf Bey’s daughters — one of Bey IV’s half-sisters. Broussard told a grand jury in 2009 that Bey IV was livid that Saleem Bey was talking with Bailey and wanted him to be dead too, but didn’t want to incur his older sister’s wrath.